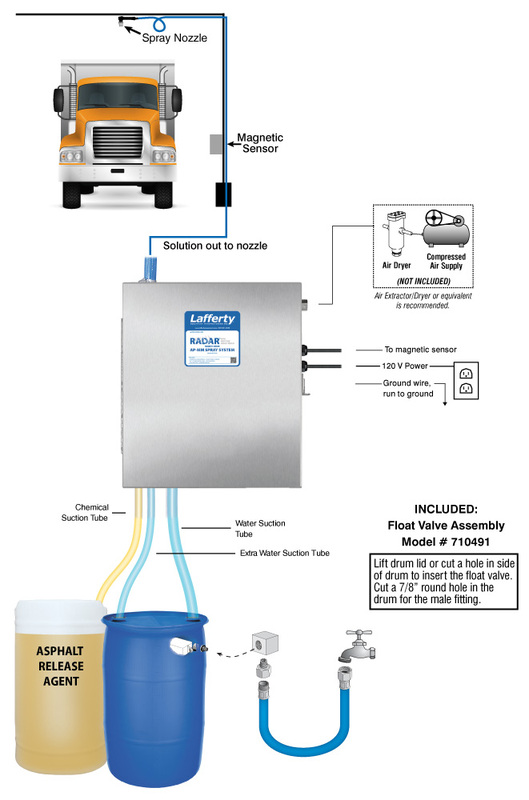 Magnetic AP-MM Asphalt Release Spray System | Lafferty Equipment Manufacturing, Inc. The Magnetic AP-MM Asphalt Release Spray System is a magnetic sensor activated asphalt release sprayer for diluting chemical concentrate "on-the-fly" using a metering manifold and for coating any length asphalt truck bed with asphalt release agent. When a truck comes into range of the magnetic sensor, the system activates and a delay timer allows the driver to position the truck under the spray nozzle before applying release agent. When the vehicle leaves the spraying area, or time expires, the system shuts down and resets. The rugged Sandpiper pump draws chemical concentrate and water from static tanks and blends them "on-the-fly"
Minimum Air Supply Line 3/8"